Hey there! Welcome back. In this video I’ll be talking about the DIY system. We’ve gone over it before, but today we’ll be taking a closer look as to how this upgrade can be immensely powerful for your business. 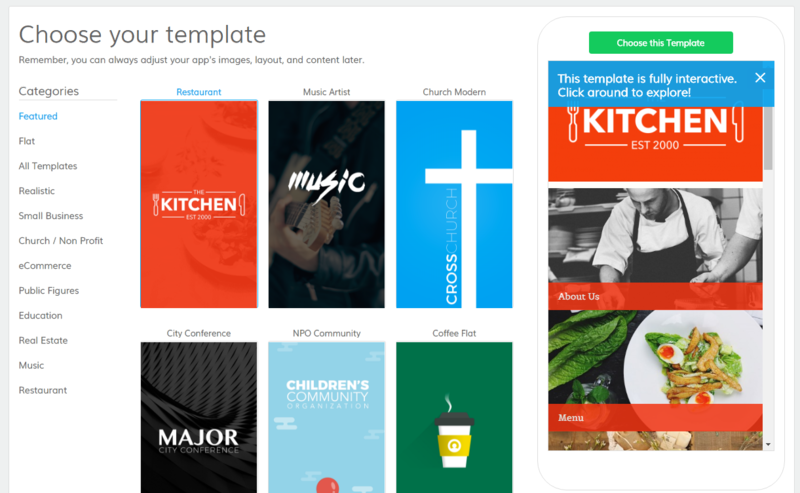 First your customer will need to Sign-Up on your platform by selecting from a variety of app templates. Once they choose a template, they would be taken into your platform so they could Build their app. Finally, in order to publish, they would need to upgrade their app by paying you. The beauty of the DIY system is that you can provide your potential customers with the ability to try your system, for free! With configurations, you can ensure that your customers will NOT be able to publish their app UNTIL they pay you first. After paying, the customer would be automatically taken back into the platform with the new ability to publish their app! A basic plan with us gives you the ability to Build an app. Only by upgrading will the Sign-Up and Payment options be available. When that’s available, then your Sign-Up page will look like this — with a variety of App Templates that your customers can choose from. This allows them to select a pre-made app to simply fill out, rather than start completely from scratch. Now once they’re done building, usually they’d have to email you and let you know that they’re ready to buy, then you’d have to continue the email correspondence until the payment has successfully been made. Our Pricing Page eliminates this back-and-forth. DIY allows you to make the payment process much slicker and less time-consuming. Once your customer is ready to pay you for the app, all they have to do is click “Upgrade” in the Top Right corner to be taken to a list of Pricing Plans to choose from. If you’re expecting a high volume of traffic to flow through the Sign-Up page and the Pricing page, then DIY is perfect. DIY is meant to supplement a business plan focused on automating much of the Customer Journey as possible. There are cases where DIY would not be helpful. This is when your business is run on interacting with customers one-on-one and building out apps alongside them, then we ask you to reconsider upgrading. Now that you have an idea of what DIY would look like when implemented, let’s go over how to set it up. 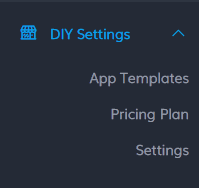 You can find DIY Settings on the left-hand sidebar. It’s split up into 2 sections: App Templates and Pricing Plan. App Templates correspond to the initial sign-up stage and Pricing Plan refers to the final Payment stage. Let’s start with App Templates. It’s split into two sections, Categories and All Templates. Each template you create must correspond to at least one or more categories. For example, this Motivational Speaker template appears in both the Realistic category and the Church/Non-Profit category. Then select the Category you’d like to put this Template under and click Save. You now have a new Category and Template! 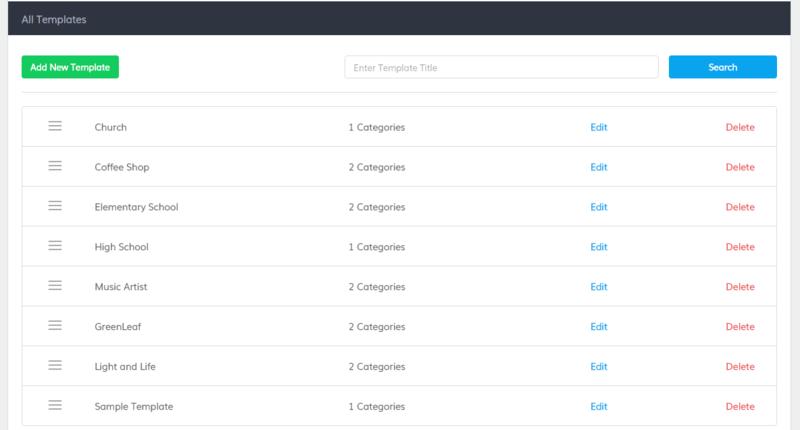 Customers will now have the opportunity to use this template to help them in building out their app. Now let’s move onto Pricing Plans. You’ll see that there are three sections: Pricing Plan, Plan Configuration, and Static Information Configuration. 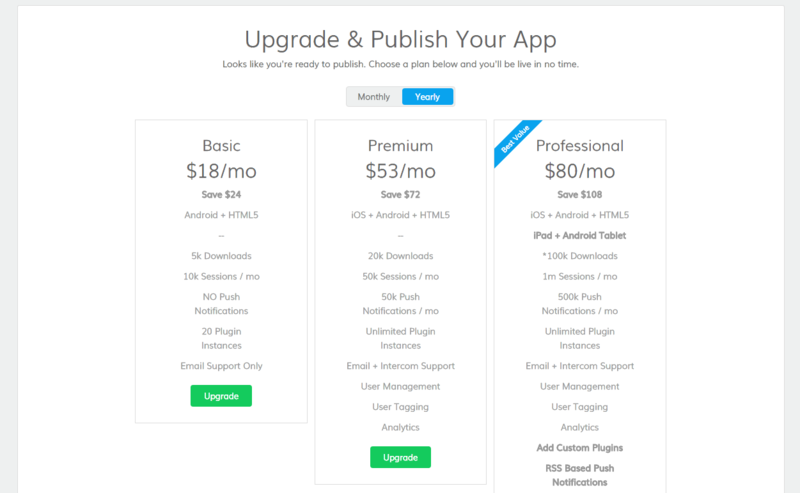 Under Pricing Plan, you can choose whether to use our build in pricing page or your own separate pricing page. Choosing ours will ensure a seamless and fluid experience with your customer. A majority of our White Label partners choose to use our pricing page. We’ll get to why we recommend not using your own pricing page in a second. Having a Recurly account is ideal. Simply click yes then enter in this information here. If you don’t have a Recurly account, go ahead and click “No”. If you do have a Recurly account, you can find the API keys by logging in, and selecting the ‘Developer’s tab on the bottom left hand side of the page. There, you will find the API key information, that you can copy/paste into the system. 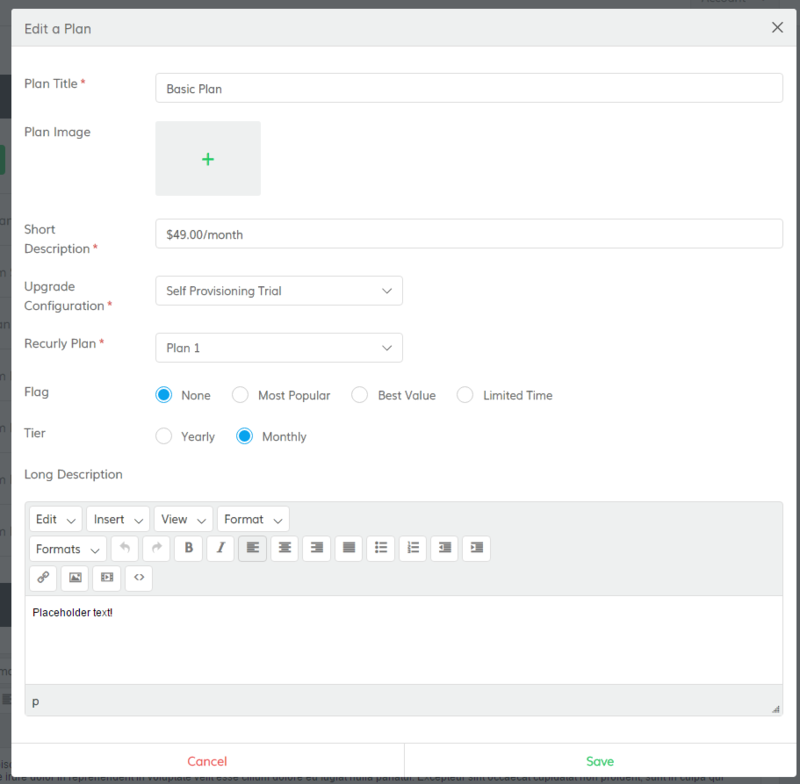 You’ll be using this section to help tier your business by upgrade plan and we do this by connecting the plans to the Premium configurations you created previously. Here we have two plans — Basic Plan and Premium Smartphone plan, with different price points. Here, you can see how we set it up. We gave it a clear and straight forward title here. Under Short Description, we explained the payment structure — by upgrading under the Basic Plan, you would pay $49 every month under the plan. Upgrade Configuration is where you would select the app configuration to tie to your plan. Purchase URL is where you want to send the user to pay. If you don’t have a Recurly plan, then this field is required. As for the Redirect URL, you need to give this link to the third-party service you’re using to tell them to send the customer back to your platform with an upgraded app once they’re done paying. Flags are just little banners that you can attach to your plan, like if you wanted to emphasize certain plans for specific reasons. Long description is a description that goes underneath the Short description that might have more details on what the plan entails — such as what publishing platforms and plugins are available in each plan. Don’t forget to click Save when you’re done. And finally, Static Information Configuration is simply text that will be displayed at the bottom of the screen. If your configurations need more detail, you can use this space to elaborate even further. Or use this space however you’d like. Why Use The Built-In Pricing Page? Now why do we suggest you use our built-in pricing page instead of your own? Well, even if you use your own, you have to go through all of these steps anyway. You still have to create a plan configuration in order to get the redirect URL, so by the time you’re done creating all of your configurations — you’ve pretty much already built a pricing page through us. So for your convenience, we recommend selecting ours. Just repeat these steps until you’ve got all of the pricing plans you’d like and you’re all set! You now have complete control over every step of your customer’s journey. If you have any questions, feel free to email our support team at WLSupport@buildfire.com. Thanks for watching and I’ll see you next time.